Confound Christmas consumerism with a gift for the world! Huxhams Cross Farm (above) needs investment and here’s why. In the UK and Europe, small farms are getting swallowed up by big ones – 3% of farms own 52% of EU land. Ecological farms such as 34-acre Huxhams Cross Farm in Dartington, Devon benefit the bigger picture. Unlike industrial farms, they practice farming in a virtuous cycle. Every good thing leads to the next. For instance, the farmers at Huxhams Cross Farm are alleviating climate change by capturing carbon in the soil. Carbon-rich soil is fertile soil full of too-tiny-to-see-with-naked-eye microbial creatures which break down nutrients to feed it to the crops, and build fertility year-on-year. As well as alleviating climate change and healing the land with biodynamic farming methods, the farmers (below) are producing healthy nutritious local food. Talk about a win-win-win solution. Apricot Centre co-directors and farmers Marina O’Connell and Bob Mehew (centre), joined by their grower, Dave Wright. [IMAGE: Beccy Strong]. Tenanted by sustainability experts (above), the Apricot Centre, Huxhams Cross Farm has two cows, Damson and Daffodil, and a mobile flock of 100 White Leghorn chickens (below) whose biodynamic eggs are much in demand. Human-scale farms do more than produce good food. Along with a band of volunteers, Huxhams Cross Farm has raised a barn, and planted over 3,000 trees and over 2,000 soft fruits plants using permaculture design methods, building community with purposeful activity. The farm grows wheat for local flour and trees for Dartington’s agroforestry project which is pioneering ways to make farming viable. Not to mention the farm’s weekly farm clubs and local food delivery service. Huxhams Cross Farm has got this far thanks to community investment through Biodynamic Land Trust not-for-profit community shares. (Am the charity’s communications manager, she says, declaring an interest). Now the developing farm needs further investment to build an on-farm centre for many worthwhile purposes. The low-carbon centre will offer a kitchen for farm-to-fork cookery activities for children and adults, as well as jams, juices and chutneys production. It will be a training space for permaculture and biodynamic farming methods and a base for the Apricot Centre’s well-being service for vulnerable families. Invest in Biodynamic Land Trust community shares for Huxhams Cross Farm to build this centre. Do you know you can also invest in community shares on behalf of others, including children? Once you have invested, the Biodynamic Land Trust will send your recipient a card, followed by a share certificate in the name of the shareholder to be transferred to the recipient’s name when they reach 16. If they are interested they may also receive quarterly updates from the farms by email or post. Together we can change the world for the better, one farm at a time. There is no getting away from it. Eating meat means taking a life. I understand the horror vegetarians feel. I love vegan cuisine. But I am a meat eater. Maybe once a week. I can feel the nutritional value it brings to my body. If I were a hunter – I imagine – I would kill the animal, and lie down and cry because I had killed it. (I saw this on TV once). Then eat it. Hopefully with reverence. But I could be romanticising. The fact is I cannot square killing for food. At least I can make sure the animal was well looked-after while alive. Which is why I choose organic meat. On Christmas day, we cooked and ate a goose from Sheepdrove Organic Farm. Declaration of interest: I work with Sheepdrove Organic Farm. But – you know me – I can only work with a cause or company I believe in. Check out Sheepdrove Organic Farm. Lots of great info on its website: including the importance of grass-fed creatures and Eating less meat? Eat better meat! Sheepdrove Organic Farm’s head butcher, Nick Rapps, is passionate about showing people how to eat organic meat in a budget. For instance, buy cheaper organic cuts (not pre-cut packages) from an actual butcher who can provide the unusual cheaper cuts. Cheaper cuts need slower cooking. Nick Rapps’s The Organic Butcher’s Blog at Food Magazine is a treasure trove of tips. Here’s Nick on the organic Christmas turkey on a budget. My sister, Geraldine, cooked our Christmas goose. Listen-up. True to our ancestors, she is a real food lover. We served the Sheepdrove goose with an array of colourful vegetables, cooked by other members of the family so not one person did all the work. 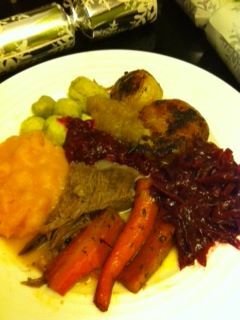 Red cabbage and apples, squash and coconut, cranberry sauce, roast potatoes, Brussels sprouts, gravy. PS I lost my ‘phone over Christmas. However – curiously – on the day I lost my ‘phone, I sent a picture of our Christmas meal (above) to myself. Which was lucky as I had not backed up my images since November so the Christmas meal pic would have been lost. Funny, eh? Christmas 2009 – how was yours? Christmas lunch. 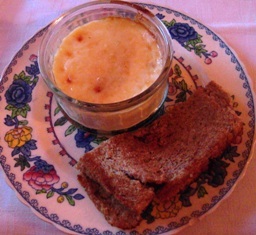 First course: parmesan custard with anchovy toast, recipe from Café Anglais, executed by my niece, Charlotte. There was a time when my mother, Fay, good Jewish mother that she is, would insist on cooking every morsel of Christmas fare. Finally we managed to persuade her we were old enough to take over. Now we share the cooking. My sister, Geraldine, cooked the goose reared by wise animal welfare expert, Sheepdrove Organic Farm, which has a shop in Bristol. From top left clockwise: the goose, then green bean, cranberry sauce, roast potato, roast parsnips, roast carrots, roast sweet potato, apple sauce and bread sauce. It sounds bloody grand and it was. A local Big Issue vendor ate nothing on Christmas day, he told me today. Juliette, eldest niece, cooked all of vegetables including her own concoction, green beans with olive oil, lemon juice, garlic, mint and a little sugar. I made the tiramisu. None of my books had a recipe but luckily I found Tiramisu Heaven. Mine did not look like Tiramisu Heaven pic above. Mine looked splodgy – see below. 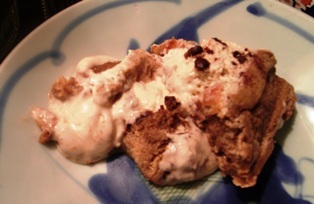 Yet it was delicious, if both bread-puddingy and way-creamy. I used less sugar than recipe (3oz instead of 4oz/ 1/2 cup) and brioche instead of ladyfingers. Lots of strong coffee. I made the tiramisu late-at-night and last-minute. After carefully separating eggs, I made fatal mistake and did to egg whites what should have been done to yolks. My mum does not use eggs at all. How sensible is that? Just 8oz mascarpone +brandy + coffee-soaked ladyfingers, sprinkling each creamy-layer with cocoa powder, and topping with rest of coffee-soaked cake. 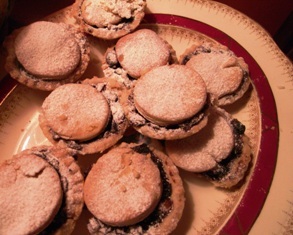 Geraldine provided an extra treat: mince pies with homemade pastry. She homemade the mincemeat too: you assemble the fruit and suet, and warm. “Dead simple,” says mincemeat-demystifier, Delia Smith. This feast was manageable thanks to six of us cooking. I made my dish in advance while others cooked on Christmas day. So division of labour was not equal. How did you manage Christmas?